There are so many little Earth Day projects that we've started around here. I think it is inspiring to see what other people have come up with, so here is a little round up of great ideas. How-to's for all kinds of great ways to save energy at Instructables. The city we live in has free recycling. As opposed to the place we lived before. There you paid for garbage. Then paid MORE for your recycling to be picked up. Our new city has it figured out. You want to recycle as MUCH AS YOU CAN when you only pay for what actually gets taken to the dump. Here are some RECYCLING STICKERS to get your bins set up. It bothers me that every day I pack a lunch lots of plastic bags get thrown out. 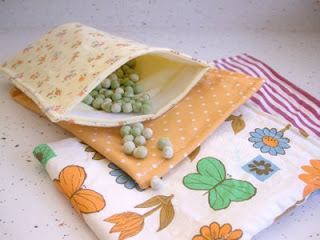 These reusable snack bags are on my to-do list. You know the old adage, "Use it up. Wear it out. Make it do. Or do without." That is Earth Care, if you ask me :) Here is a quick fix that makes "make it do" looks great! Thank you for linking PassiFlora magazine! I enjoyed reading your posts and will be coming back. Thanks for the great ideas! I had a few on my to do list and needed a reminder. Others I've now added. This earth day finally got me to add to my blog. Check it out.